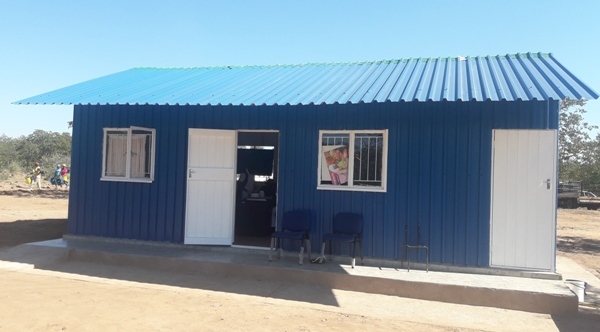 The Senator for Beitbridge Cde Tambudzani Mohadi officially handed over the Malabe border health post which was constructed through an initiative by the ministry of health and child care, Development Aid from People to People and Elimination 8 in Beitbridge District recently. Speaking during the event attended by over 300 people, Cde Mohadi said Malabe Health Post aims to improve timeous detection of cross border malaria cases in order to clear the reservoirs of infectious parasites that contribute to on-going transmission in SADC countries aiming to eliminate malaria. Speaking at the same occasion DAPP Zimbabwe project leader Petros Muzuva said Malabe health post is one of five Elimination 8 border health posts in Zimbabwe namely Chinaka ( Mutasa) Sango Border post ( Chiredzi), Rwenya ( Mudzi) and Ganganyama ( Rushinga). He highlighted that 3 of the 5 health posts are already operational and the other two are in their construction phase. Apart from providing Malaria Diagnosis, Treatment, and Surveillance package, Malabe health post will also provide other primary care services such as OPD consultation, treating of minor injuries, Family planning, Nutrition, HIV and AIDS related conditions. Swaziland, Namibia, Mozambique, Botswana and Zambia.